Have you ever wanted to soar high above the turquoise waters of the island paradise of Key West, Florida? Join our professional parasailing staff for an exhilarating sky-high tour off the coast of the vacation destination of Key West.There is not a better vantage point to see the beautiful coastal landscapes of Key West than from a parasail while gliding six hundred feet above the gorgeous waters of this area. You can select to try this fun-filled activity by yourself or choose to go up with a friend on a tandem tour. This is a great activity for a couple to experience together. The dizzying heights and one-of-a-kind view will create a fun shared experience. 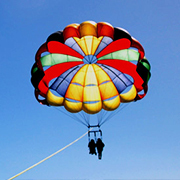 Parasailing is not only the best method of sightseeing while vacationing in Key West, but it is also an exhilarating thrill ride that will rival any amusement park attraction which is why parasailing is a top thing to do in Key West. We only use state-of-the-art safety equipment (harnesses, parachutes, safety lines, life jackets, etc.) on our parasailing tours. Our conscientious personnel meticulously maintain all of our parasailing gear in order to ensure a safe and fun-filled adventure for every participant. Our sleek and powerful jet boats will quickly allow riders to reach astounding heights. Each of our Key West parasailing pull vessels are outfitted with a custom back deck for smooth take offs and landings. You can remain completely dry on this exciting aerial tour; you do not even need to get your feet wet. But, if you would like a wet and wild adventure, our drivers can accommodate you. Be prepared for an awe-inspiring view of the island of Key West, soaring six hundred feet above the brilliant blue waters that surround the island. You will always remember this thrilling aerial adventure. 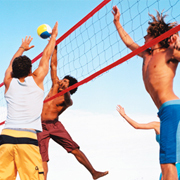 An All-Day Beach Pass fits well for individuals who want to enjoy the beach at their own pace. Our All-Day Beach Passes give you access to Smathers Beach, along with access to a wide variety of beach and water sports and activities! Call (866) 608-7185 now for help finding Things to do in Key West. 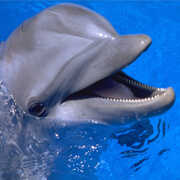 Watching dolphins frolic in the gorgeous waters off the coast of Key West will be the highlight of your vacation. You'll have the chance to snorkel above the only living coral reef in the continental United States.